Many SaaS companies like yours struggle to come up with content topics that are valuable to their audience, but they may not even know they’re sitting on a treasure trove of information. Every time a customer uses your software, it produces valuable data. You can track things like how often a user logs in, which features they use and how frequently, and how long they use your product each time they log in. Savvy SaaS companies use this data now to understand their customers better, help fuel product design decisions, or look for good opportunities to sell current customers on the value of upgrades or add-ons. Product use data can help you better understand your own product through the eyes of your customers. But it can serve another, equally useful purpose for your content team. The data you already have on how your customers use your product can likely be mined for insights that help answer questions from your audience. Companies that produce original research quickly learn it’s one of the best ways to drive traffic, build links and gain shares. When Moz did an extensive analysis of the kind of content that most consistently earns links, content built on original research was one of the two categories that performed the best (the other category is opinion-forming journalism). People love statistics. They provide evidence that feels trustworthy. And they’re the kind of thing bloggers and journalists are quick to link to when the data backs up a point they’re making in a post or article. The media embraced data journalism a while back; content marketers can and should do the same. And SaaS companies have a head start. In fact, you can skip the work of doing a survey and use the data you already have. If you’ve grown accustomed to looking at your data one way, seeing it in a new light that would be valuable to your customers could be difficult. It will help to see a few examples of how other SaaS companies have turned their aggregate product use data into content people care about. FreshBooks has done an impressive job of building a business with inbound marketing. It targets small businesses and freelancers and has built up a large enough customer base to tap into some valuable insights about how small businesses charge, invoice and get paid. It’s used its data to produce content on multiple occasions. 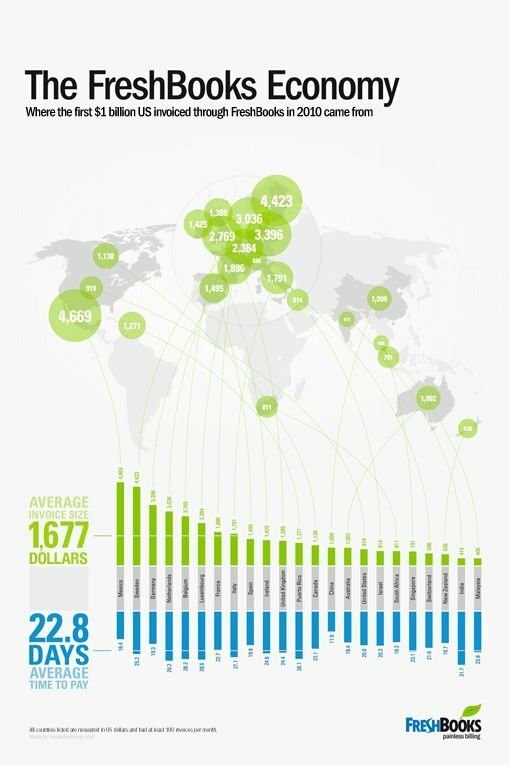 In 2010, it put together an infographic that shows the average invoice its customers sent ($1,677) and how long it typically takes the company to get paid (22.6 days). Knowing how long payment usually takes helps anyone who has a small business or is thinking of starting one make their own payroll and pay bills on time. And getting a glimpse into what other small businesses and solopreneurs are charging can help you figure out if your own pricing is reasonable. More recently, FreshBooks wrote a blog post based on data it had collected on how invoice terms and wording influence the time it takes to get paid. If late payments are a common problem for any of its customers (and for at least the freelancers, they likely are), then knowing that using polite language increases the likelihood of getting paid by 5 percent is an especially useful bit of data. Buffer gets accolades for its content marketing and that reputation is well-earned. Brands have a lot of questions about what works on social media and many feel like they’re just guessing. If you use Buffer, then your flailing helps create the data that all Buffer readers can use to improve their social media marketing. Ever wondered what the best time of day is to post on the different social media platforms? Buffer’s aggregate data has some answers for you. Not sure if you should bother with that hashtag? Buffer’s data shows that tweets with one or two hashtags get 21 percent more engagement. Over a few years, it has collected a significant amount of use data that provides specific, actionable insights to customers. More importantly, Buffer has published it for any brand to see, so all the businesses in its target audience can benefit. Yesware’s sales automation software allows salespeople to send emails and track stats on their performance through the platform. As such, Yesware has been able to collect some serious data on what types of emails perform well. Looking at data from more than 500,000 emails its clients have sent, it was able to pull out which words in a subject line tend to lead to higher and lower open rates. 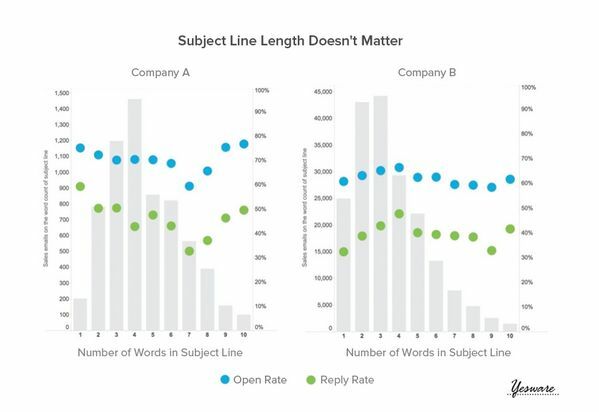 It also analyzed what works best in terms of subject line length—and found it really doesn’t matter. Getting a lead or customer to open your email is a challenge every email marketer and salesperson faces. Clear data that tells you what to do (and what not to do) is something every business in Yesware’s target audience can use. How many of these examples included information you were interested in? Probably at least one of them. Data is interesting. Sometimes it gives us insights we suspected, but couldn’t prove. Other times it shows us something we never would have guessed. Either way, if your software has any data your customers may find useful or interesting, use it. Release a report. Turn it into an infographic. Get it out there in a format that gets people talking. Your traffic and conversions will thank you.